HAMK’s School of Professional teacher education is one of five state-recognised teacher education providers in Finland. Pursuant to Finnish statute on teacher education, Häme University of Applied Sciences (HAMK), School of Professional Teacher Education (SPTE) is one of five state-recognised teacher education providers in Finland. We offer pedagogical qualifications and further education programmes for teachers and professionals in higher education, vocational education, upper secondary education, adult education and training, public sector organizations, human resources management, as well as industry. The International Teachers for the Future – Pedagogical Expertise Programme (20 ECTS) is a continuing education Programme for teachers who have the ability to act as change agents, peer educators and messengers, and who wish to become pedago​gical experts. It is competence-based and multidisciplinary by nature, tailored for teachers of various subject fields and cultural backgrounds. The Programme combines theory and practice in student-centered teaching and offers an opportunity to benchmark the world’s best-renowned education system with colleagues around the world. The next programme begins in September 2016. Upon graduation, the participants receive a certificate of participation and a transcript with details on content and extent. The ECTS system allows the participants to transfer credits later within European higher education system to any European higher education institution. ​​Our tailored teachers training programmes are co-created together with our partner institutions based on the results of a training needs and organizational needs analysis, and can vary in length, extent and in implementation method. They are most suitable for educational institutions, educational networks, or governmental organizations aiming at reform and systemic change. In our tailored programmes, the organizational support is essential part of the process. Teachers’ learning and organizational learning is combined to achieve educational innovation that leads to transformation. The process takes into account various stakeholders’ needs and interests, and often includes leadership and management training. Häme University of Applied Sciences HAMK offers Kazakhstani professionals carefully tailored development programmes funded through Bolashak. The internship programmes are organised during 2017 in Hämeenlinna, Finland. It is hard to think of any better place for developing pedagogical skills than Finland, globally known for the high standard of education. Below you can find our internship programmes that are available now. Read more and apply for the Bolashak Scholarship to start your studies with us. The applied pedagogical competence is developed through theory and practice in the field of teacher development. The methods of teaching and learning used in the programme will model the full range of skills and methods applied in Finnish education system. The programme is provided by Häme University of Applied Sciences HAMK in collaboration with Jyväskylä University of Applied Sciences JAMK. If you have any questions, please do not hesitate to contact us. We will be glad to tell you more about the programme and studying at HAMK. You know what they say – practice makes perfect! And Hämeenlinna has had plenty of practice over the centuries to make itself a real treasure, both for adventurers and for those who simply want to relax and enjoy everything the region has to offer. This includes its impressive castles, charming attractions and fascinating museums, in addition to its birdsong, the crunch of white snow under your step and unforgettably beautiful landscapes: for example, Aulanko’s forest parkland, the Evo hiking area and National City Park. Do you wish to develop your teaching skills, knowledge of applied contemporary pedagogy and innovative thinking? Take a chance to study for 2 months in the heart of Finland. You will be hosted by Häme University of Applied Sciences HAMK and Jyväskylä University of Applied Sciences JAMK, known for top quality pedagogy and successful cooperation in Kazakhstan.The programme is aimed at Kazakhstani teachers from technical and vocational colleges (TVET), universities as well as secondary and upper secondary schools. Kazakhstani teachers have a great chance to participate in our carefully tailored professional development programme in Finland. This programme is designed for Kazakhstani teachers from technical and vocational colleges (TVET), universities as well as secondary and upper secondary schools. The main focus will be on teacher development: applied pedagogy, curriculum and pedagogical innovations in schools. The 2-month programme will consist of a mixture of seminars, workshops, observations, study visits and teamwork led by experienced teacher trainers. Programme will also include collaborative seminars between Finnish and Kazakhstani teachers, partnership schools and participants of the programme to share experiences. Applied pedagogical competence is developed through theory and practice in the field of teacher development. The methods of teaching and learning used in the programme will model wide range of skills and methods applied in Finnish education system. The programme is provided by Häme University of Applied Sciences HAMKin collaboration with JAMK University of Applied Sciences, both known for top quality pedagogy and successful cooperation in Kazakhstan. Teacher Internship Programme will take place in autumn 2017. These 2‐month studies will consist of a mixture of seminars, workshops, visits and teamwork led by experienced teacher trainers, placements in partnership schools. Programme will also include collaborative seminars between Finnish and Kazakhstani teachers, partnership schools and participants of the programme to share experiences. The language of the programme is English, interpreted into Russian. Our modern learning environments and digital learning technology will be utilised during the studies. ​Summary: 20 teachers participating training programme. Duration: 2+5months. Gira Mundo Finlândia Paraíba -Professional Development Programme is a continuing education programme for higher educatian and K-12 teachers. The programme is divided into two parts. During the study months in Finland, the participants study in HAMK learning environments depending on their field of expertise. The programme provides both practical, hands-on experiences, as well as theoretical insight into the core components of applied learning. The second phase of the programme concentrates on the practical application of the newly learned methods in the local learning environments. Guidance is provided using modern e-learning methods. The participants are awarded 12 ECTS credit points certificate on level seven Bologna frame of reference. ​​Summary: ​Altogether 22 teachers participated the training. Duration of assignment (months): 3 + 5 months. The VET Teachers for the Future – Professional Development Certificate is a continuing education programme for higher education and vocational teachers. It is competence-based and multidisciplinary by nature, and always tailored for teachers of various subject fields who wish to learn how to combine theory and practice in teaching their own field of expertise. The eight-month programme is divided into two parts. During the study months in Finland, the participants study in HAMK or TAMK learning environments depending on their field of expertise. The programme provides both practical, hands-on experiences, as well as theoretical insight into the core components of applied learning. The second phase of the programme concentrates on the practical application of the newly learned methods in the local learning environments. Each participant produces a development plan in collaboration and under the guidance of our Finnish experts, and in cooperation with the home institution. The practical part of the development plan is then implemented in the participant’s country of origin. Guidance is provided using modern e-learning methods. The participants are awarded 20 ECTS credit points certificate on level seven Bologna frame of reference. The one-week Training Programme for Educators from SESI and SENAI provides a unique window to the Finnish student-centered approach in teaching and learning, with an aim to develop teachers’ professional skills in order to apply them in a variety of learning and teaching environments. The concentration of the programme is in the combination of theory and practice using collaborative learning methods and real-life examples from Finland. At the end of the programme, the teachers are required to complete a short personal development project in order to demonstrate their ability to apply the newly acquired knowledge in a classroom environment. • How can managers support the above best practices? ​Summary: Altogether 16 teachers participated the training. Duration of assignment (months): 5 + 5 months. The ten-month programme is divided into two parts. During the study months in Finland, the participants study in HAMK or TAMK learning environments depending on their field of expertise. The programme provides both practical, hands-on experiences, as well as theoretical insight into the core components of applied learning. The participants are awarded 30 ECTS credit points certificate on level seven Bologna frame of reference. ​Summary: ​Altogether ~14 teachers participated the training. Duration of assignment (months): 5 + 5 months. ​Summary: ​Altogether ~16 librarians participated the training. The Library and Life-long Learning programme provides an introduction to the library services in Finland and in Finnish educational institutions. The concentration of the programme is in the integration of library services to the lives of individuals in general to promote reading and life-long learning, as well as in the collaboration of libraries and educational institutions to promote pedagogical use of libraries, critical thinking, and research skills. In addition, the programme prepares the participants to draft a development plan for their own library networks. ​Summary: ​​​Altogether ~21 upper secondary teachers participated the training. ​The programme is a nine-month continuing education programme for upper secondary teachers which is implemented in Finland. The programme includes two parts: 1) English language training using the CLIL method (six months) and 2) Innovative Pedagogy Research Internship (three months), with periods of job shadowing and practice in Finnish schools. Entrepreneurship education, study guidance, special needs education and related themes are one part of the programme. – performance of professional competence study of medical colleges and university graduates in nursing. ​Summary: Altogether ~26 SENAI experts participated the training. Training Programme to develop Excellence in Skills for Brazil’s national Industrial Training Service (SENAI) aims at teachers and experts working in SENAI with Skills competitions on both national and international level. The programme supports the coaching skills and the professional growth of experts in all skills, and it deepens the pedagogical thinking in their coaching work. The training gives advice and support on how to promote the attractiveness of vocational education and skills competitions in their country and in their institute. The training includes benchmarking of the Finnish National Skills Competitions and meeting of Finnish Skills experts. 1. The first core result will be a MAP: A guideline containing models, hands-on instruments (methodical-didactical) and crucial principles for the optimal implementation and enforcement of IL. The guideline will be published in all partner countries´ languages. 2. The second product will be a qualification unit for teacher training based on the guideline, to be test run in England and in Slovenia as implementing countries. 3. Thirdly, the project will contribute with a multimedia documentary of best practice cases from pedagogical experiences in the four partner countries during the project period. The documentary is meant to visualize and inspire new users of IL-methodologies. – The goal of the project is to develop the dialogical competence of entrepreneurship trainers and coaches through concrete methods. – A concrete result will be the web service for further dissemination and exploitation, method descriptions of dialogue learning, training programme and other online material related to learning dialogue, including videos of training sessions (Youtube), as well as the minimax containing the methods developed in local languages (ES, SI, BG, EN, LT), with the exception of FI. ​Summary: HAMK Experts participate in project planning, implementation and evaluation. HAMK experts also belong to project board and work as experts in the project. Effective implementation of the national School Sector Reform Plan 2009-2015 leading to quality education for all in Nepal. Increased competence of Tribhuvan University – Faculty of Education (TU-FoE) to implement the Teacher Qualification Upgrading Program for 13,000 working teachers in Nepal. ​Summary: ​HAMK Experts participate in project planning, implementation and evaluation. HAMK experts also belong to project board and work as experts in the project. Quang Tri Teacher Training College (QTTTC) delivers quality training programs that reflect the local labour market needs and enhance regional integration. The purpose of the project is to strengthen the competency-based approach of the Finnish higher education curricula. The project also contributes to the working life relevance into the practical curriculum and degree design. ​Summary: ​The purpose of the project was to enhance the educational management and leadership skills of Quang Tri Teacher Training College in order to better respond to the challenges that policy-level higher education sector reform causes in Vietnam. JAMK University of Applied Sciences was the coordinating institution and the project partners were Häme University of Applied Sciences (HAMK), Quang Tri Teacher Training College (VN) and Hue University (VN). The project addressed the needs of the administrative staff of QTTTC by supporting development of skills and tools to manage the change, in particular, in curriculum development and quality assurance. Furthermore, the teaching staffs’ pedagogical understanding, skills and use of new methods in implementing new curriculum were supported. For developing educational leaderships and management capacity among the whole staff of QTTTC, three training programmes were developed and development tasks to address the future change were assigned to the administrative and teaching staff. As concrete outcomes of the project 70% of the staff members successfully completed the training programmes, new leadership and management processes and tools are in use, new pedagogical methods and eLearning courses have been developed and piloted. ​Summary: ​YVI Project (2010-14) is a national project for promoting entrepreneurship education especially in vocational and academic teacher education in Finland. ​Summary: ​The DIALE project concentrates on the transfer of unique and active pedagogical innovation, independent of the field of education and focusing on vocational teachers, trainers, tutors and the improvement of teacher education. In addition, the target group includes in-company trainers and teachers working in further education services. Skills in dialogue can be used in teaching and guidance work in classroom and distance education, work mentoring and cooperation, independent of the field of the activities. The goal of the DIALE project is to develop the competence of trainers, teachers, teacher trainers and in-company trainers in dialogue through concrete methods. Practical operations: – Translation of deep learning through a dialogue web service (EN) – Developing concrete methods in dialogue (4 sub-groups) – Piloting and testing the developed methods – Planning the training program for the development of competence in dialogue The DIALE project uses tools and applications of social media for development work as well as project planning and coordination. The project is coordinated by HAMK Vocational Teacher Education Unit and partly funded by the LLP/ Leonardo da Vinci programme. ​Summary: ​ValoDi, Valorisation of Diversity Skills was a Leonardo da Vinci project under the Lifelong Learning Programme (2009-2011). It was a continuation to the TforD, Tools for Diversity project (Leonardo da Vinci, 2006-2008), which dealt with multicultural issues. Multiculturalism is a growing value in the development of the personnel of different organizations in education and customer service. In addition to the development of the personnel in multiculturalism, ValoDi focused on enhancing multiculturalism in the operations and strategic planning of the management of the organizations. Multiculturalism and equality in this case meant equality regardless of gender, health, mother tongue, ethnical background, age, religious beliefs, values and opinions. The project emphasized individual’s legal rights and the integration to the society. The project aimed to create multiculturalism in a way that it would be seen as a competitive value, which can be categorized, evaluated, learnt and further developed. The project also aimed to develop teachers’, trainers’ and work place instructors’ multicultural skills in a way that they can systematically develop their own organization towards more multicultural and innovative direction. ​Summary: ​The goal of this project is to develop a web-based tool – ‘TrainerGuide’ -, a digital handbook and toolbox for the primary target group in-company trainers. This guide will be based on the successful results of a Danish model project (Danish Ministry of Education, 2006), whose principles will be transferred to the partner countries’ needs and conditions. A European TrainerGuide will be developed in English, which will be an overarching version for national guides in national languages. The European TrainerGuide will mirror the partner countries’ strengths, needs and development fields. In this way, other countries may benefit from the European TrainerGuide, which will be filled with best practice examples, and they may find inspiration for an own national guide. Denmark will also profit directly from the project, by improving the Danish TrainerGuide with the partner countries’ best practice examples, tools and valorization initiatives. In this way, it is also expected to expand the application of the TrænerGuide to further sectors in Denmark, to adapt new practical training tools and to brand the Danish guide for training companies. The partner countries in this project are countries with a dual VET system, or countries whose VET systems have needs and goals that could be supported by a TrainerGuide. The partner countries will end up with national TrainerGuide versions each in their own language. The long-term vision is to create a sustainable platform for an ongoing co-operation and co-ordination between the partner countries and other European countries. The European TrainerGuide may become a practical rotation point for this purpose. ​Summary: ​The aim of the project was to expand the international cooperation started during the ModVocPilot project and supporting projects before, spread the good practices of coaching. The project also compared, improved and unified the curricula to approach the European level in different European countries, to develop European training programme and training models and create opportunities for on-the-job learning for students of European countries. The project also enhanced the close co-operation between schools/ institutions and companies, which enabled expert exchange with the staff of the companies and visits in the educational establishments. The main objective of the project was to support participants in the training and further training activities in the acquisition and the use of knowledge, skills and qualifications to facilitate their personal development. In the project activities, this meant preparing a competition task according to the trade description, which was based on EuroSkills regulation. The development and implementation of the task was done in cooperation with educational institutions and industry both at national and international level. Students, teachers and industrial experts from different European countries took part in the work. The participants for the EuroSkills 2010 competition were selected from an international cooperation group whose experts were trained in coaching for the skills competition, implementing and evaluating competition tasks. The material was also used in vocational education and national competitions of different countries from the beginning of the basic training phase. Paraiba state governor met with the 38 Gira Mundo 2017 program participants. “Each time, we have more teachers capable of leveraging the indicatiors of eduation in Paraiba, as they are assuming ther ole of leaders of this process” , the state education secretary concluded. A group of enthousiastic rectors from China studyed student-centered and active learning methods at HAMK, while bringing valiuable insight for the trainers. HAMK School of Professional Teacher Education Dean Seija Mahlamäki-Kultanen and team meet with the Uruguayan delegation on vocational education to Finland, composed of the membes of ANEP, INEFOP and UTU, at the Embassy of Uruguay. Instituto Federal Fluminense organises a training event on VET Teachers for the Future – program and it’s multiplication effect of the Finnish profesional education model. Within the Finnish Prime Minister’s Delegation visit to Colombia, Häme University of Applied Sciences representative visits Pontificia Universidad Javeriana in Bogotá. Prime Minister Sipilä underlines the importance of education as a basis for peaceful development, during his visit to Colombia, in which HAMK participated in investigating educational solutions in the Colombian post-conflict context. On the occasion of Prime Minister Sipilä’s visit, to who’s delegation HAMK participated, President Santos of Colombia speaks of taking example in Finnish education and teacher training (1:10-2:00) to bring Colombia’s education to the top of Latin America. HAMK delegate on Prime Minister Sipilä’s visit to Colombia attends luncheon at the Presidential Palace, upon invitation by President Santos, Nobel Peace Price Winner 2016. HAMK joins the Team Finland delegation to Peru to investigate cooperation opportunities in education. Häme University of Applied Sciences, part of the Finnish Prime Minister’s Delegation to Colombia, visits Tecnológico de Antioquia in Medellin. HAMK, within the Team Finland delegation, lead by Vice-Minister Lehtomäki, is received by the Governor of Antioquia in Medellin to discuss cooperation in education. Finnish teacher student from HAMK does her teacher training in Paraiba, Brazil, as part of the partnership signed between HAMK, TAMK and the State of Paraiba. Instituto Federal do Sul de Minas signed a Memorandum of Understanding with Häme University of Applied Sciences (HAMK), to further develop common programs and exchanges. Finland’s new educational revolution to prepare students for the digital era. Wlamir Soares, a teacher of the Instituto Federal de Sergipe returns to Finland to become a teacher trainer in Brazil and multiply spreading innovative methodologies. IF Sudeste de Minas Gerais News: Dr. Regina Lianda, graduate from The VET Teachers for the Future- program gives a presentation at III Fórum Mundial de Educação Profissional e Tecnológica, in Recife Brazil. Professora do Câmpus Barbacena, participante do “Programa Professores para o futuro – Finlândia. (12.6.2015). Corado, C. & Ryymin, E. (2018). Building Quality Education and Sustainable Future in Finnish-Brazilian Teacher Education. Finnish Journal of Professional and Vocational Education, Digital Special Edition 20(5), 98-104. Gresse von Wangenheim, C., von Wangenheim, A., Santana Pacheco, F. C. R. Hauck, J. & Ferreira, M. (2015). Design and Experiences with Teaching Physical Computing in Family Workshops. INCoD – Brazilian Institute for Digital Convergence. Technical Report INCoD/GQS.04.2015.E. Korhonen, A.-M. Learning is my Journey – Scaffolding Digital Personal Learning Environments in Teacher Education Context. Paper presented in The 8th Annual International Conference on Education and New Learning Technologies (EDULEARN 16), 4.-6.7.2016, Barcelona. Kunnari, I. & Ryymin, E. Successful Teacher Development in the Digital Era – The Role of Wellbeing and Networked Expertise. Paper presented in EAPRIL (The European Association for Practitioner Research on Improving Learning) Conference, 3.-25.11. 2016, Porto. Kunnari, I. & Ryymin, E. Joyful Teacher and School Development for Successful Change in Pedagogy. Paper presented in International Leading Passion – Motivation and Work in the Post-Industrial Era Research Conference, 19.-20.4. 2016, Porvoo. Mahlamäki-Kultanen, S. Teacher Education Reform in Finland. Paper Presented in XI CONNEPI – IFAL Congresso Norte Nordeste De Pesquisa e Inovação, 6.-9.12. 2016, Maceió. Pelachim Lianda R.L.. Implementando abordagem centrada no estudante e metodologia abp em estudos de química orgãnica. Poster presented at Problem-Based Learning and Active Learning Methodologies, Pan-American Network For Problem-Based Lerning (PAN-PBL), 8.-10.9. 2016, São Paulo. Pelachim Lianda R.L., Pereira, N.C., Fonseca Dinali, L.A., Oliveira de Paula, A.F., Dinali, W., Ryymin, E. & Joyce, B. Implementing Student-Centered Approach and Project-Based Learning (PBL) in Organic Chemistry Studies. Paper presented at Problem-Based Learning and Active Learning Methodologies, Pan-American Network For Problem-Based Lerning (PAN-PBL), 8.-10.9. 2016, São Paulo. Ruhalahti, S., Kunnari, I. & Korhonen, A-M. How to Deepen Competence Development through Autentic and Dialogical Learning in Digital Learning Environments? Paper and workshop presented in EAPRIL (The European Association for Practitioner Research on Improving Learning) Conference, 3.-25.11. 2016, Porto. Ryymin, E. Learning in a Digital Age – A New Pedagogy or just a Tool? Key Note Speak in 25th European Forum of Technical and Vocational Education and Training (EfVET) 26.-29.10. 2016, Valencia. Uebe Mansur, A., Ryymin, E., Joyce, B. & Ruhalahti, S. Project-Based Learning Applied in Brazilian Entrepreneurship Class: A Model from Finnish-Brazilian Case Study. Paper presented at ADVED16, The 2nd International Conference on Advances in Education and Social Sciences, 10.-12.10. 2016, Istanbul. Ueber Mansur, A.F., Joyce, B., Biazus V. M.C. and Siqueira, E.L.G. Results Analysis from Peer Assessment for Entrepreneurship’s PBL class in Business Management Undergraduate Course (pp. 244-251). PAEE ALE 2016, The 8th International Symposium on Project Approaches in Engineering Education, 6.-8.7. 2016, Guimarãe. ​de Melo Filho, I., Gomes, A.S., Joyce, B., Korhonen A-M & Ryymin, E. (2015). Integration service development of informallearning activities within the distance education in Brazil​. In A. Suominen, H. Toivanen & M. Nieminen (eds.) Innovation policies for economic and social transitions: Developing strategies for knowledge, practices and organizations (pp. 414-418) . VTT oy: Espoo. Kunnari, I. & Ryymin, E. Promoting Science and Education between Brazil and Finland by Applied Research. Presentation in Conferência Internacional de Educação Professional do IFPB Instituto Federal, 9-11.12. 2015, João Pessoa. Mahlamäki-Kultanen, S. (ed.) (2015). 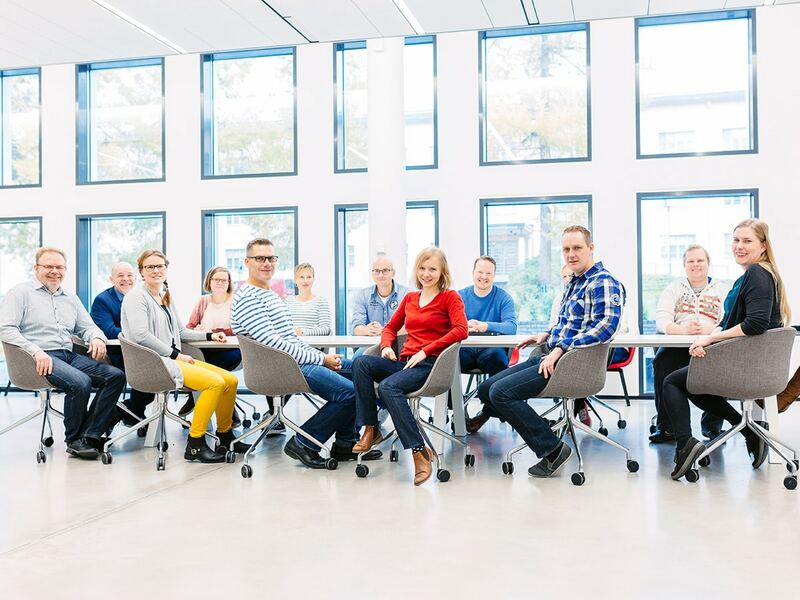 VET Teachers for the Future – Professional Development Certificate Programme in Häme University of Applied Sciences (HAMK) & Tampere University of Applied Sciences (TAMK). HAMK AOKK:n julkaisuja 3/2015. ​Majuri, M., Ryymin, E., Viskari, M. & Kokkomäki, J. (2015). Researching Professional Excellence Regionally, Nationally and Globally​. In Mustonen, L. (ed.) International Collaboration – Towards Joint Research Activities (pp. 11-16). HAMK Publications 6/2015. Tammerprint oy: Tampere. Ryymin, E., Kunnari, I. & Viskari, M. Design-Based Implementation Research in Education Business. Paper presented in national AMK- ja Ammatillisen koulutuksen tutkimuspäivät -conference, 23.-24.11. 2015, Helsinki. Ryymin, E. Teacher Education and Co-Operation with Enterprises and Industries. Paper presented in III Seminário Internacional de Educação, FIESC, 20.-21.10. 2015, Florianópolis. Ryymin, E., Corado, C., Joyce, B., Kokkomäki, J., Kunnari, I., Laurikainen, M., Lianda, R & Viskari, M. (2015). Finnish-Brazilian Learning Process as an Experimental Path towards Pedagogical Change. Paper presented in NOLAN, The 8th Nordic Latin American Research Network Conference, 11.-13.6.2015, Helsinki. Kunnari, I., & Ilomäki, L. (2014). Reframing teachers’ work for educational innovation. Innovations in Education and Teaching International, (ahead-of-print), 1-12. Ruhalahti, S. & Korhonen, A.-M. (2014). Pocket sized, autentich, dialogical and mobile learning.